Eight children with heart conditions, who are in need of urgent medical help, have travelled to Moscow from war-ravaged eastern Ukraine. Parents and doctors told RT that due to the humanitarian crisis, it was impossible to treat the kids locally. 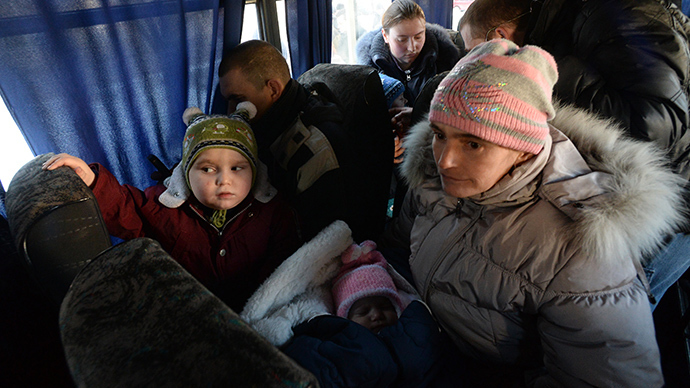 The children are from Donbass region, with the youngest patient being less than a year old. They were transported by a Russian Emergencies Ministry plane and taken to specialized hospitals in the Russian capital on Thursday. The hospitals in Moscow have advanced technology treatment facility’s that those in the east of Ukraine lack. The evacuation of children was organized by the Russian philanthropist Elizaveta Glinka, who is widely known as Dr. Liza for her humanitarian and charity work, the TV Tsentr (TVC) channel reported. “All the children have severe congenital disorders, mainly with heart diseases. One child has multiple congenital anomalies, including a central nervous system disorder and a cardiovascular system disorder,” a leading doctor at one of Moscow clinics where the children were taken, told TVC. Natalya Yermolayeva, the mother of baby Alyosha (Alex), who is only 15 months old, described how there was no one left to take care of her child where they lived. “He has five heart disorders, but the local cardiologists have left so there was nobody to monitor his [state of health]. He also has a congenital fissure of the hard palate, which means we have to do another operation,” she said. Another patient, who it just 1.5 months old, is a little girl called Sadiya. She suffers from myelomeningocele, which is a severe form of protrusion of the spinal cord, and had already been operated in Ukraine. However, she got complications and is now in an urgent need of diagnostics and treatment. RT’s Murad Gazdiev had previously met the children and their families at the Central Clinical Hospital in the war-torn city of Donetsk, in the east of Ukraine, while they were waiting to get the medical help they so desperately needed. There was understandable relief amongst the parents that their children would be finally getting the care they deserved. “We were offered treatment, and we’ve been waiting for this for some time. We’re happy it all worked out,” one of the parents told RT. Due to the current state of the Ukrainian economy, large numbers of families have no way of paying for expensive operations. The United Nations Children's Fund (UNICEF) stressed in March of the urgent need to protect medical facilities and to make sure medicines and medical supplies were safely delivered to conflict-affected areas in Ukraine. More than 3,000 civilians have died and over 2,200 people are missing since the start of the military conflict in the self-proclaimed Donetsk People’s Republic, the local human rights commissioner’s press service said on Thursday.